Note: SpiralSynth isn't being supported any more due to lack of time, and the existance of SpiralSynth Modular. Which is much better featured and developed. 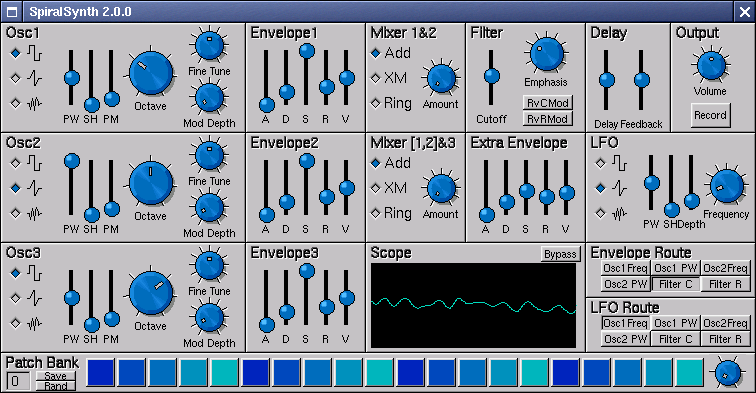 SpiralSynth is a simple polyphonic analogue modelling softsynth that tries to be as easy to use as possible. Use the pawfal forum for feature requests, bug reports etc etc. SpiralSynth is released under the terms and restrictions of the GPL license. To build SpiralSynth from source, you need FLTK. The latest version was built with fltk 1.1.0rc2. If the synth clicks like a skipping CD, you may need to reduce the sample rate in the options window. 22050 should be low enough for most CPU's. (It's default is 44100). You can also try increasing the buffer size or playing with the fragment size and count.